HitFilm Express takes your workflow to the next level. Seamlessly combining a huge array of features providing amateurs and professionals everything they need to see a project through to the end. Personalizable workstation: Adjust your interface using the collapsible and expandible panels to ensure you have access to the things you need and aren’t distracted by panels you don’t. Your personal interface can then be saved as your default layout. Enhanced performance: You can customise your playback quality and paused quality. This allows you to experience really fast playback in the editor and trimmer, preventing lagging and making it much easier to time up edits/cuts. Not only can you playback at a different quality, you can now control that quality from the menu in the viewer. This allows you to make faster, snappier edits. Mask editing and rendering: Masking is used to manually create a matte. A matte determines which parts of a layer are visible. Practically, this means that masks are used to cut holes in your layers. 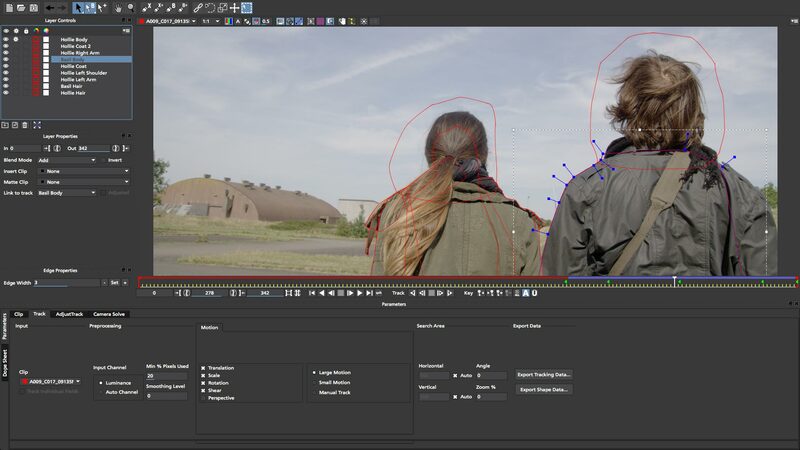 HitFilm Express’s mask editing is faster than ever before enhancing and speeding up the rotoscoping process. As video quality increases, the software must be capable of handling everything it’s given which is why performance has been boosted. Export Queue: HitFilm Express’s export queue allows you to set up a list of edits and shots to export while you’re away from your desk. If you close down the software, the export will automatically resume when you load it back up. Export presets: Export presets let you configure your export settings for high quality or high compression. Just drag and drop your selected presets, make it the default and move on to the next task. Export is available in multiple formats including 16-bit Add-on Required color and industry standard GoPro Cineform (Win) or QuickTime ProRes (Mac). Professional formats: HitFilm Express’s UHD support and RAM preview ensures the best possible quality for your projects. Work with all footage, from your vertical smartphone shots to high-end professional cameradocumentaries, HitFilm can handle it. Intelligent search: Quickly locate what you need with HitFilm Express’s keyword search and find feature for all your media, effects and composite timelines. Coming from another software system? No problem, our algorithm recognizes keyword links to help you find what you’re looking for. HitFilm Express provides a range of powerful non-linear editing tools ensuring you have the right tools for the job. Transitions: Make a smooth segue or eye-popping transition between shots with one of HitFilm Express’s dissolve, push, slide, split, wide, zoom, fade or iris transition features. You can even build your own transition type within a composite shot or the editor timeline. 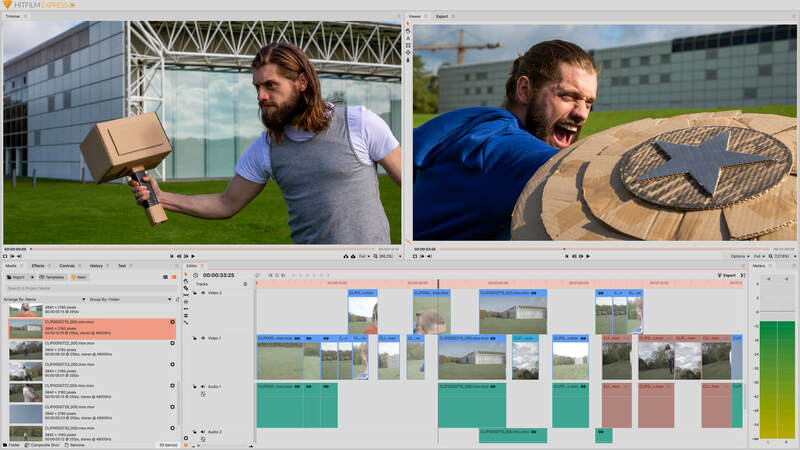 Dedicated trimmer: Get your rough cut looking sharp with HitFilm Express’s dedicated editing trimmer – complete with insert and overlay functionality. Cut it even quicker with customizable keyboard shortcuts to set the ‘in’ and ‘out’ points in the trimmer. HitFilm’s Particle Simulator is a very powerful tool which allows you to play God. Create weather systems, grow your own cities or summon swarms of creatures - it’s all in HitFilm Express, from grid patterns and fractally-warped, audio-influenced 3D forms to chaotic, physics-driven simulation. HitFilm houses over 400 unique effects and presets, each of which can be pulled apart, altered and put back together again to create something entirely new. Color Support: Use 16-bit color grading Add-on Required to add vibrant color tones and textures that jump off the screen. No banding, no pixels, just smooth gradients and future-facing films. You can use work from almost any source and resolution – even 4K UHD. Curves: Allow yourself to bend the truth in each scene. HitFilm Express’s curve effects give you extremely fine control over the final look of your shots. Extensive presets: Found your signature look? Save it with HitFilm Express’s color settings presets so you can quickly recreate it in your next project. HitFilm Express includes hundreds of presets as standard, with many plugins for additional power and flexibility. Grading toolkit: HitFilm Express’s extensive collection of color grading tools lets you customize your own look and lighting. Each tool can be applied to the entire shot, or specific areas of the frame, to ensure precise color grading. You can even grade several layers at once. Hyper-stylized effects: Channel your inner Van Gogh with HitFilm Express’s hyper-stylized color effects. Create dream-like sequences or somber moods with effects like oil painting, solarize, posterize and cartoon. Matte cleaning: Key to the highest standard with HitFilm Express’s matte cleaner tool. Get high-quality composites every time through smoothing, feathering and choking the edge of the key. Spill simulation and light wrapping: HitFilm Express’s unique spill simulation feature replaces unwanted light reflections from your green screen with realistic simulated light from your new background. You can even add the light wrap effect for a more realistic light bloom around your foreground elements. Green screen: Clean up your green screen footage with HitFilm Express’s effortless broadcast-quality chroma key. Use the technology to get high-quality removal from blue or green screen, control over edge detail, color correction and advanced spill replacement. Animations: Animate objects and shoot with virtual cameras and lights, with real-time shadows, reflections and physically-based lighting producing super-realisticresults. Experience lightning-fast load times, film box support and added .FBX import. Import animation: HitFilm Express offers support for a number of 3D formats including OBJ, LWO and 3DS. Alembic ABC and Filmbox FBX can also be imported with geometry animation for individual models and groups within HitFilm Express. Depth maps: Improve your perspective with HitFilm Express’s depth maps for all 3D layers (3D models, planes and particle systems). Composite different objects together using depth information for masking and occlusion. Get all the benefits of 3D data while compositing in 2.5D with effects and filters. Unified 3D space: You can position a 2D green-screened actor in the cockpit of 3D model helicopter without any layering tricks! HitFilm Express’s unified 3D space feature allows you to create layers and models that interact in the same space. Add effects like motion blur and depth of field using the software’s built-in cameras for a more realistic look. Doppler shift: Helicopter landings and revving engines sound as real as they look with HitFilm Express’s doppler shift feature. Simply attach audio to your animated 3D layers and HitFilm will automatically apply doppler shift as the layer moves towards (and away) from the camera. HitFilm Express comes with a huge amount of specialized effects built-in allowing you to easily enhance your film visuals, creating memorable and impactful scenes. Warping tools: Twist and distort your footage for that added cool factor using HitFilm Express’s vortex displacement, bezier warps, perspective and polar warps. You can flatten your action footage to match your traditional lenses or use Action Cam Lens Distort; making it easy to layer your composites directly onto footage filmed with action cameras. Hide objects: Don’t let rogue pedestrians come between you and your perfect shot. Clean up your footage by easily hiding or duplicating objects with HitFilm Express’s clone stamp and replacement tools. Audio-syncing: HitFilm Express introduces the new audio sync tool. By simply selecting multiple clips in the media panel, HitFilm will automatically sync the files. HitFilm Express comes with a range of free training resources to provide you with the information you need to go from amateaur to pro. While you learn our online support systems are ready to provide you with technical guidance.